Hello all. Plenty to update you on as we’ve had a very busy week indeed – we’ve seen an Argentinean in his underpants in the full glare of day, uncovered another example of a country/city promulgating some very generous PR about itself, and I became genuinely scared of a public transport system. 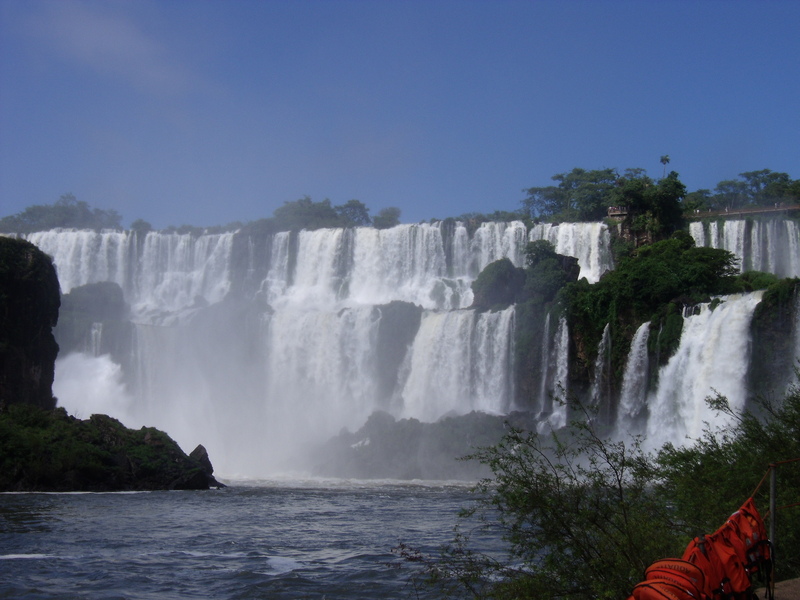 We last updated you from Puerto Igauçu (or Igaussu, or Iguasu, or Iguazu depending on who you’re listening to) on the eve of our visit to the falls. It really was phenomenal. I’m not sure how many separate waterfalls there are, but it’s upwards of 20, some of which are huge. The sheer power and noise is really amazing. Jane has been to Niagara and wouldn’t give it the time of day after Iguaçu. The set up is great as well and the handily signposted trails take you through lush forests right up to the edge of the falls. We did the Argentinean side on the first day and went back into Brazil for the second day (which was a bit of a bureaucratic nightmare, with passport control on both sides and on the outward and return leg – we also failed to “officially” leave Brazil the first time which was rather a worry but thankfully the very nice customs lady had clearly seen it all before). 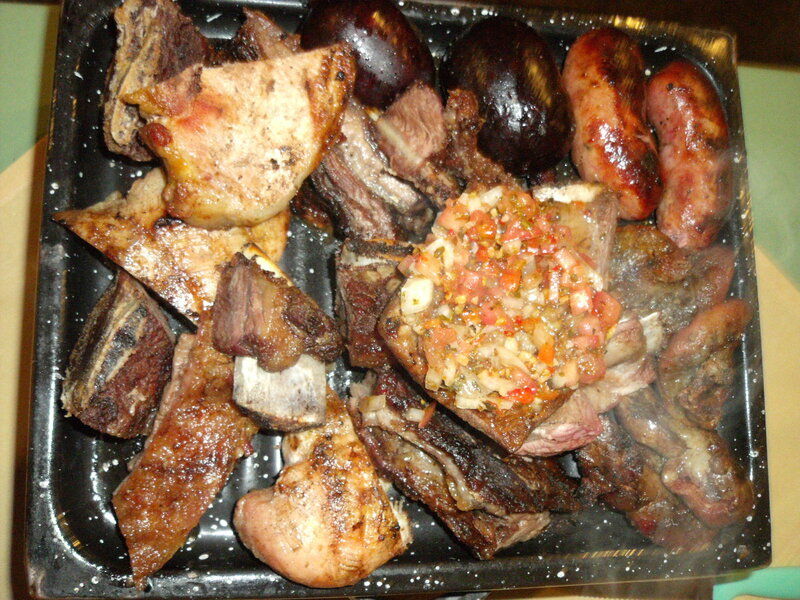 You’ll see from the photo one of the meals we had in Puerto Iguaçu – a mixed grill. The photo doesn’t do it justice: 2 large sausages, 2 black puddings, 4 kidneys, 2 pieces of chicken, 1 pork chop, 1 veal steak and several ribs and bits of steak. With chips and a salad this totally defeated us, but the leftovers made for a nice lunch the next day (as a side note, money goes a lot further in Argentina – this meal plus a mid-range bottle of red came to about 12 quid total). On the Argentinean side of the falls, you’re closer to the action and we decided to take a “Maid of the Mist”-style boat trip at the foot of one of the bigger falls. You get soaked, but that’s half the fun, and it’s very hot, so you dry pretty quickly. This didn’t prevent an Argentinean fool from stripping down to his smalls for the ride, which he thought was fine, but there were small children in tears and 20 or 30 adults giggling and taking photos (you’ll be pleased to hear that Jane not so covertly captured the moment – the woman has no shame where semi-naked men are concerned!). What goes through some people's heads? From Iguaçu we got an overnight bus to Buenos Aires, after our original plan to head for a place called Salta was amended when we found out that it would have taken the best part of 2 days on the bus to get there (but we’re planning on detouring there on our way through Chile in a month or so). 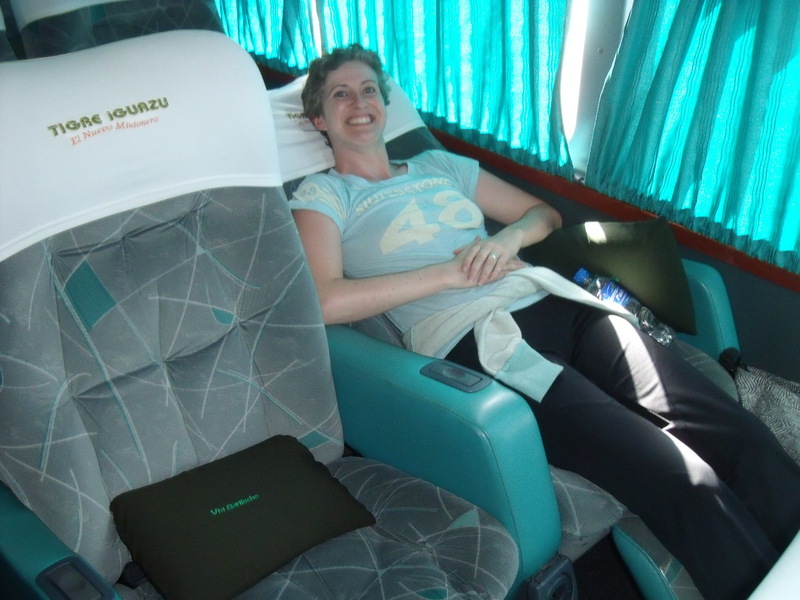 The buses in Argentina are quite impressive – even the bog standard seats recline a long way and you get food and drink, and the slightly more expensive “suites” (which we treated ourselves to on the way to Mendoza) recline to completely flat, come with a dry sherry before dinner and a whisky before bed! Anyway, the bus to B.A. was fine apart from the perennial problem of people playing music on their mobile phones and expecting that everyone on the bus wants to hear it. The only surprise on this occasion was that the culprit was a guy in his mid-40’s rather than a 15-year-old with a highlighted mullet (there are lots of “wacky” haircuts amongst the male youth of Argentina). It beats a National Express coach! So, to Buenos Aires. For those of you with a romantic image of B.A. as a kind of “Paris of the south”, cover your eyes. We were disappointed. 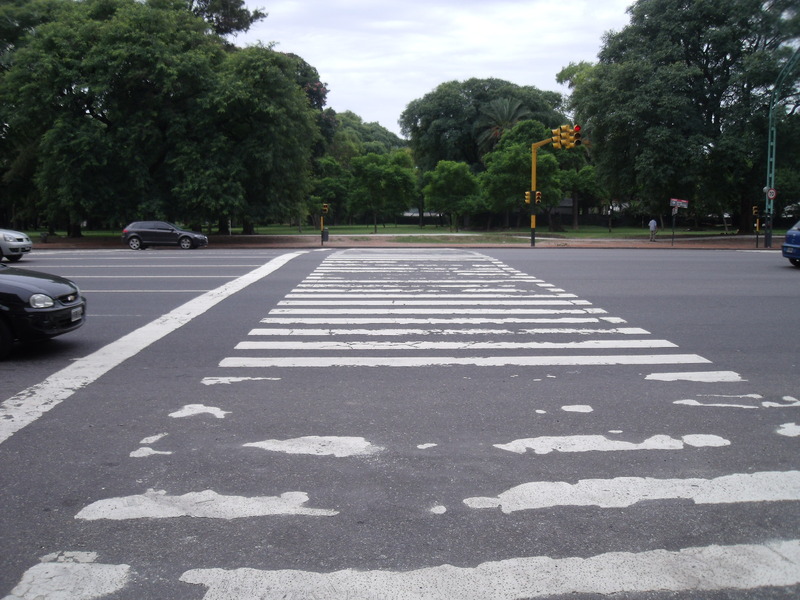 We’d heard talk of wide boulevards, pleasant strolling in leafy neighbourhoods, cafes on the pavements etc. In reality we got broken pavements like minefields because of all the dog crap, no real show stopping sights, graffiti everywhere (especially on the city statues and monuments) and an almost constant aroma of urine. All of this was beaten by the Subte (underground system), where I have never felt less comfortable. This probably wasn’t helped by the fact that on our first journey I was subjected to another attempted pick pocketing (I’m starting to think that the tattoo on my forehead saying “I’m an idiot tourist, please take my belongings” might not have been a good idea). This time it was a team of three – 2 women who came to either side of me in a pincer movement as we were getting on the train, and a burly chap behind who went for my pocket with his sticky sausage-fingers. Thankfully I realised what was happening just in time and got my hand to the pocket at the same time as he did (Jane remained oblivious as usual). However, this experience meant that from then on I was scouring every platform for thieves (they all looked like possible robbers after that first journey) and clutching all my belongings to me to the point where my knuckles were white – this even after Jane had bravely taken ownership of all the belongings and told me to pull myself together! Needless to say, no one tried to rob the wife. Our considered opinion of B.A. It’s unfair to say that B.A. was all bad; it is certainly not without its charms. We strolled round the central district on our first day there, which was pleasant enough whilst being unremarkable. 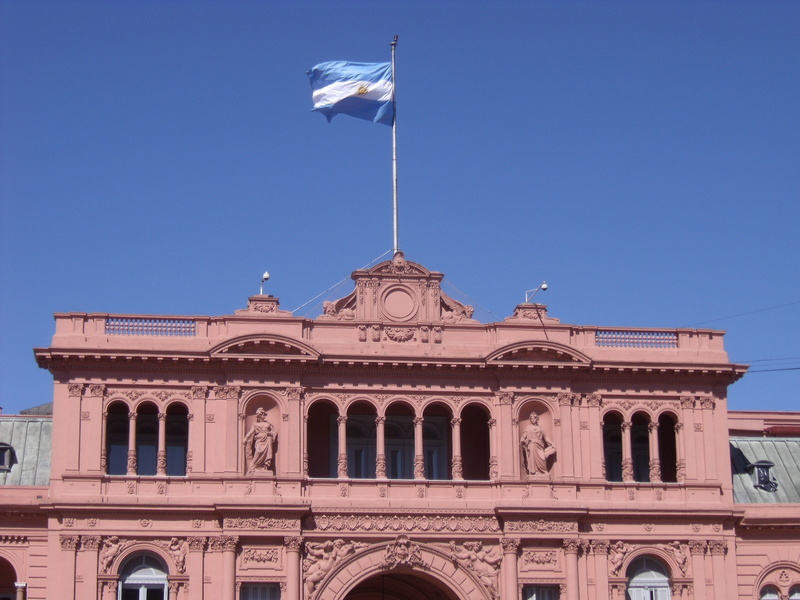 We saw the Casa Rosada, which prompted Jane to start singing songs from the Evita soundtrack on a loop (and a week later this new habit shows no signs of stopping). 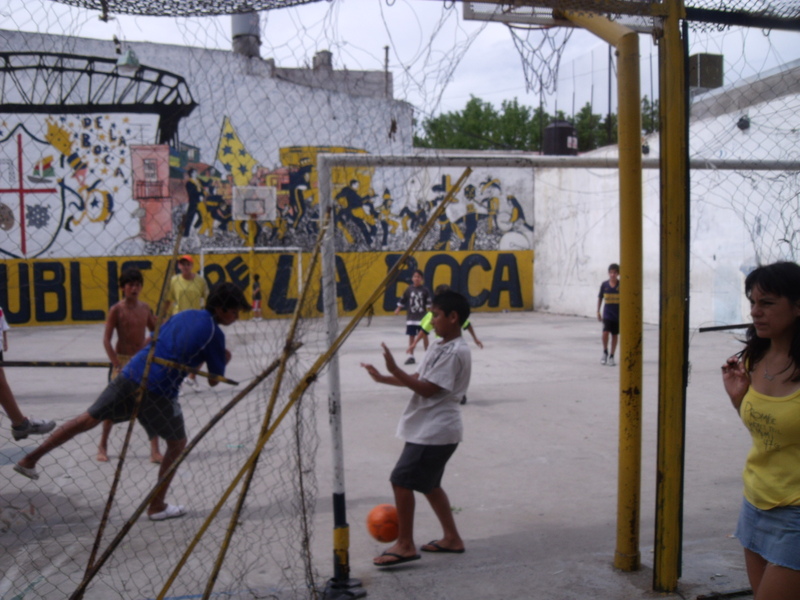 The following day we had a walk to Boca (like walking through the deserted industrial outskirts of Paris – maybe that’s where “Paris of the south” comes from), to try but fail to get tickets to a Boca Juniors game (0-0 bore draw, so a blessing in disguise). 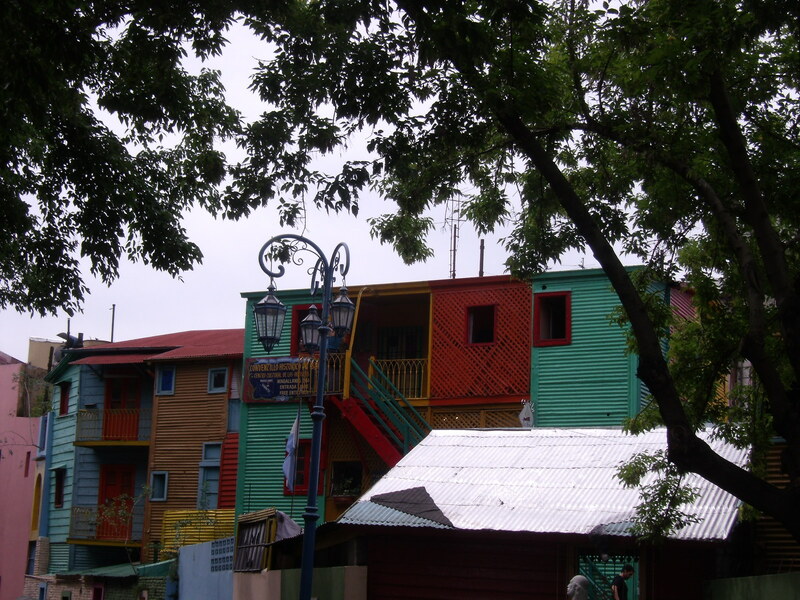 Boca itself was pretty uninspiring – we were told it was colourful and vibrant, in fact there was one tourist trap street with painted houses a la Disney and the rest of the place was a dump. 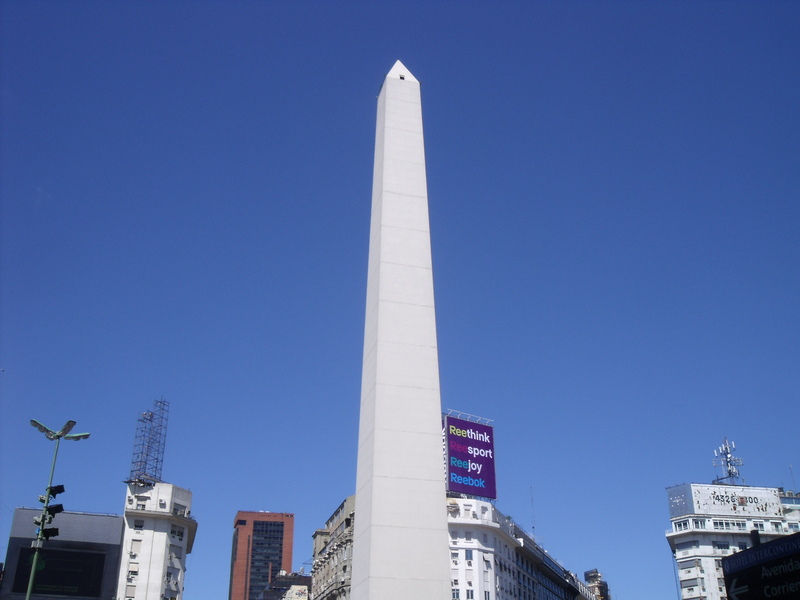 In the afternoon we went to Recoleta, which was a vast improvement. 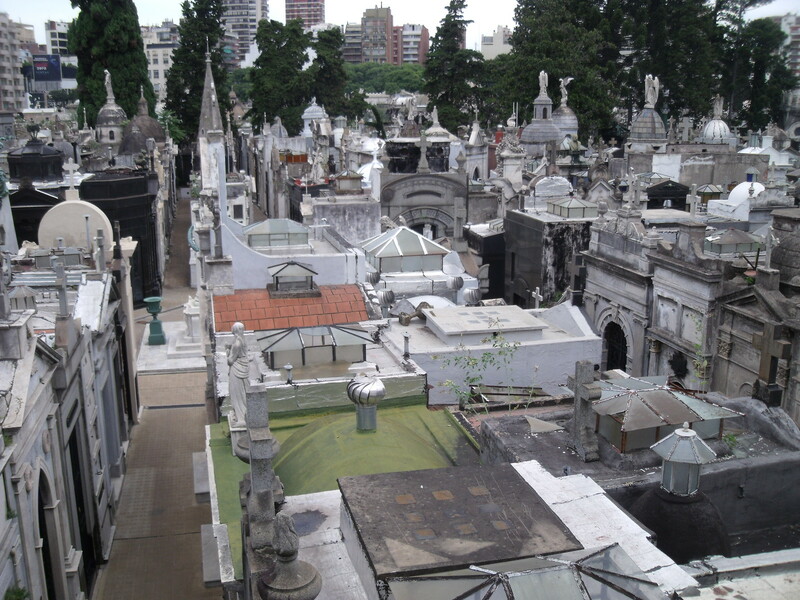 We visited a basilica (it had been at least 4 days since our last church so withdrawal symptoms were starting to set in), a very picturesque cemetery where Eva Peron is interred (cue more warbling from Jane) and a fantastic old mansion which houses the museum of decorative arts. This was a very nice afternoon almost spoilt by a frantic, increasingly desperate 20 minute search for a toilet of any description (where do these people drink/eat/evacuate?!! ), which almost ended in disaster when I found the holy grail of toilets in a shopping centre, began to relax, only to find the outer door locked. Thankfully a kindly shopkeeper took pity on this sweaty, disheveled, whimpering Englishman, opened the door to the staff-only loos and saved the cleaners a lot of work. You’ll be amazed to hear that these exchanges were topped yesterday, when our wine-tour guide asked if anyone was vegetarian and an American woman sat adjacent to Jane and me piped up with “It depends”. This was bad enough, but after a heartbeat she followed it up with “Is it meat?”. Some people. Valentine’s Day was a lazy day (we’d pretty much done B.A. by now!) and we celebrated in style with a couple of pies for lunch and a Bolognese pizza in the equivalent of Pizza Hut for dinner (before you scoff, both were very nice). It’s just a shame we couldn’t have got tickets for the football, which would have been the icing on the cake. We had actually planned a tango lesson but to my eternal disappointment, Jane needed non-rubber soled shoes and didn’t have any, so we had to give it a miss. We had a stroll to San Telmo in the early evening, which we’d visited on the first evening and found to be almost deserted, but which was lively and much more convivial on the Sunday evening, with a market and music. On our last day in B.A. we were filling time I’m sorry to say. However, when filling time, you can see some good stuff. 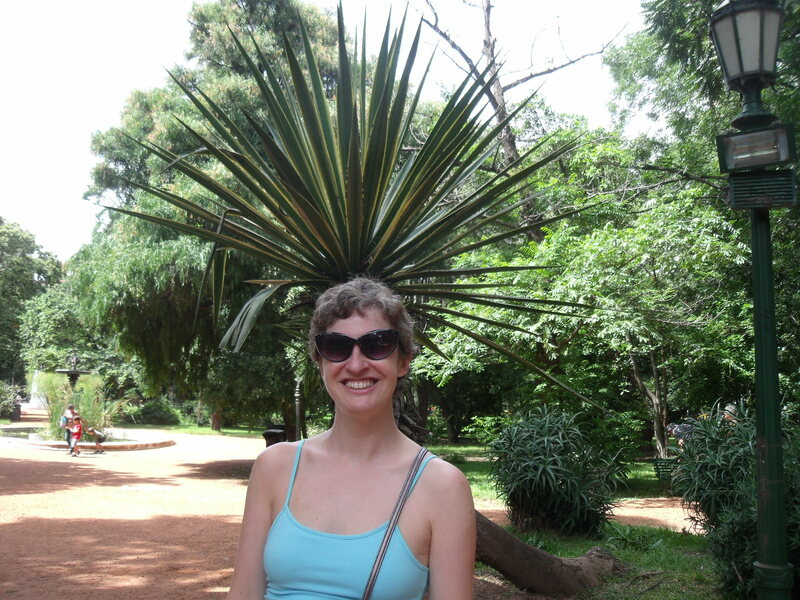 After the botanical gardens (rubbish), we went to the excellent Buenos Aires zoo! It was great and we saw all sorts of crazy beasts, most of whom I’m glad to say were not pacing up and down in that slightly distressing way that caged animals sometimes do. We also went to the Evita museum to try to get this damned singing out of Jane’s system (it was closed!) and a pleasant Japanese garden. So that was B.A. – sorry if you’ve booked expensive flights to go there, but I’m sure our hell is another person’s heaven and frankly, the problems with B.A. are nothing that a few billion pounds spent on cleaning/restoration/anti-pickpocket measures/dog extermination squads/public lavatories wouldn’t resolve. 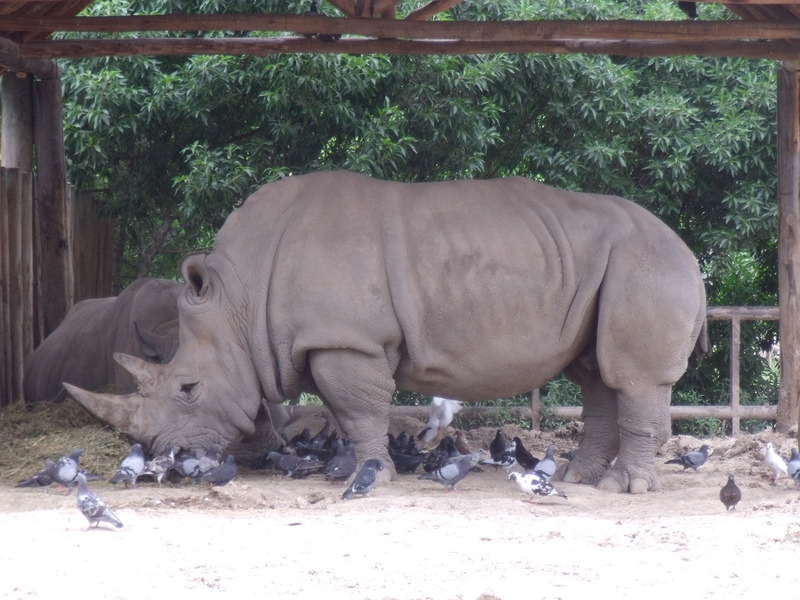 We won’t be returning in a hurry (unless they get new and exciting creatures in the zoo). 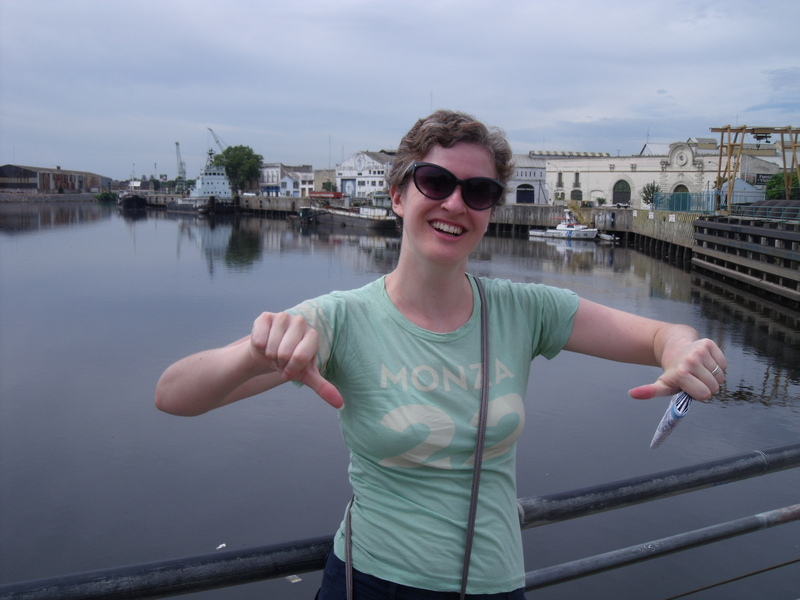 And now we’re in Mendoza, but only really for the bodegas (wineries), although Mendoza itself is a pleasant enough place full of racist taxi drivers (“watch out for the Chileans they are all thieves”) and ropy, unclean hostels (ours). Seriously, it is a lovely city. We had another long walk round the city and parks a couple of days ago, for which I chose the wrong footwear after misjudging the distances and had to walk the last 43 miles barefoot (thankfully the B.A. dog poo problem is not evident here). Yesterday we did our wineries tour, which showed the process at three different local wineries (Malbec is the main variety here for those with an interest) – one of the largest in the area, a medium-sized one and a small, organic place. We were concerned by the number of apparent experts spitting their tasted wine out, or throwing most of it away and especially the middle-aged English prats who swilled, sloshed and sucked in a manner surely only a professional wine-taster could do with a straight face. Obviously we did not avail ourselves of the spittoon. The wine tour was followed by a sumptuous lunch consisting of a large table full of tapas-style dishes (cheeseboards, cold meats, dishes of vegetables, pulses, eggs, bread) – more than enough for a meal in itself. This was followed by 2 empañadas each, which was followed by a bowl of risotto each, which was followed by a bowl of spag bol each (in case we were short of carbs – most people were declining the food at this stage, including, to my surprise, Jane), which was followed by an ice cream sundae (which I myself declined – I don’t have much of a sweet tooth). 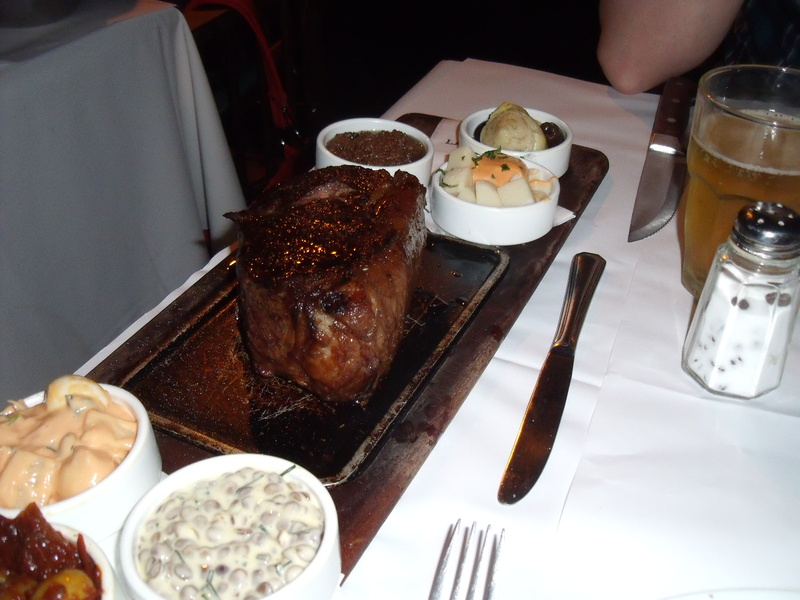 Really, really good – we certainly didn’t have dinner last night. Apologies for the lack of photos, our camera was seriously playing up in Mendoza, but you can view our Mendoza photos on Flickr here! So, that’s where we’re up to – we head to the Argentinean lake district tonight (El Bolson will be our base for those who are interested), for some (Jane has promised me) light trekking and stunning scenery.